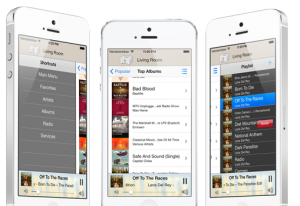 Finally there is an improved controller App for Sonos available on your iPhone or iPod Touch! Tap or drag the player on the top and you’ll find the players view to select a new player and with volume controls for all players. From here you can also enter Zone Management, where you can group and ungroup players with drag and drop. shortcuts to most used functions: drag the main menu to the right to get shortcut buttons for artist, albums, radio and musicservices. you can control the volume of every player directly from the player selection screen. No need to switch players anymore. You can start SonoPhone with the ‘sonophone://’ URL from other remote Apps. Its also possible to hand over a return URL, then a new icon is displayed to return to the automation App. Further option include to select a default player or default menu. – Sonos is registered trademark of Sonos, Inc.